Bumblebee and his team's adventures on earth continue with 6 all new episodes of Transformers: Robots in disguise. 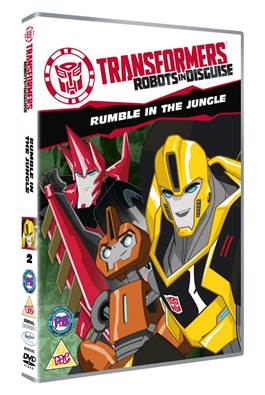 It s a chaotic time for the team as Grimlock inexplicably attacks his teammates, Bumblebee is exposed to a toxin as he pursues escaped Decepticon, Quillfire and a group of Skunkticon thieves go on the rampage. Meanwhile in the Prime Realm, Optimus must prepare himself for an evil that will threaten both Cybertron and Earth with destruction! Six Episodes from season 1. Rocky has been a fan of Transformers for a very short time but with him he gets obsessed very quickly. After receiving this DVD his love for Transformers has grown and grown and we now have a list of toys he wants for his birthday. When asked about the DVD he said "it's funny and good and got Robots..." he's 3, all you'd need to add is a cake and he'd be in heaven. This bright, colourful and cheery DVD is 6 episodes long and runs for 126 minutes. You can choose to run the DVD through fully (for when they're ill in bed) or choose your episodes individually. This gives him and me a time schedule, I know that I have a certain amount of 'quiet time' before he becomes a nightmare again, I like to call this Ready, Steady, Clean time. For this reason I give it a massive thumbs up, Rocky too.